The Model C7422 is just one of Werlatone's High Power 6" line section Directional Couplers. Covering the full 2-30 MHz band, the C7422 is rated for 50,000 W CW. This robust design is supplied with 3 1/8” EIA main line connectors, and either N Female or BNC connectors on the coupled ports. Single frequency & Multi-Octave designs are available. 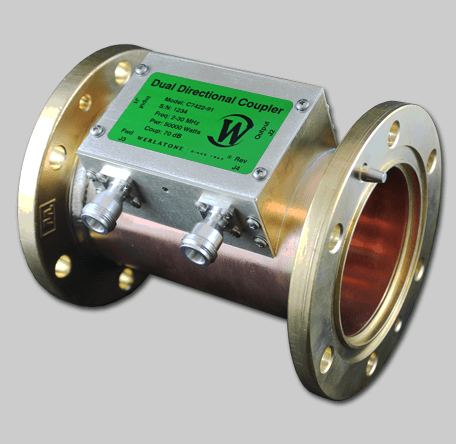 The Model C7422 is just one of Werlatone’s High Power 6″ line section Directional Couplers. Covering the full 2-30 MHz band, the C7422 is rated for 50,000 W CW. This robust design is supplied with 3 1/8” EIA main line connectors, and either N Female or BNC connectors on the coupled ports. Single frequency & Multi-Octave designs are available.